We are sad to report that another beloved greyhound has passed on to the Rainbow Bridge. Ladybug was diagnosed with kidney cancer that made her very sick quickly. Charlie and Shirley Gill adopted Ladybug from us in September 2007. Shirley and Charlie are senior citizens and Shirley is often confined to a wheelchair. Ladybug was a sweet and laid back girl that was perfect for this couple. Two years ago, Shirley and Charlie brought Ladybug to our Christmas Parade at the Country Club Mall in Cumberland. Ladybug walked along side Shirley’s wheelchair and won the crowds of people over. She was just a wonderful companion for them. She seemed to be as happy as a dog could be with Charlie and Shirley and every time we spoke with them they made sure to tell us how much they loved Ladybug. Everyone in the neighborhood loved Ladybug and the delivery people always came with treats for her. She loved coming out on the porch and greeting everyone. She seemed to have brought a whole community of people together. 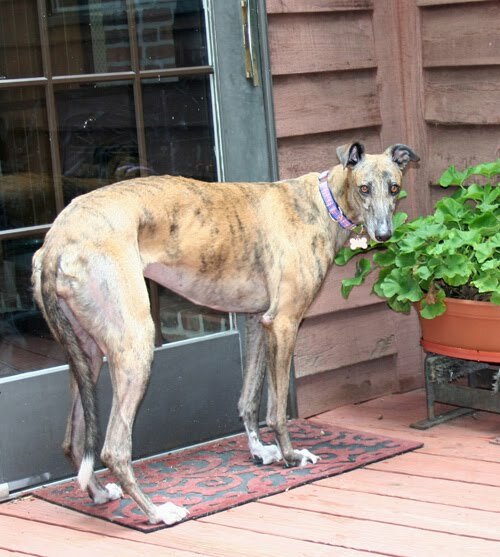 We know that the Gills are devastated over the loss of a relatively young greyhound. But we know that Ladybug had a wonderful home where she was loved so much. That is all any greyhound deserves.